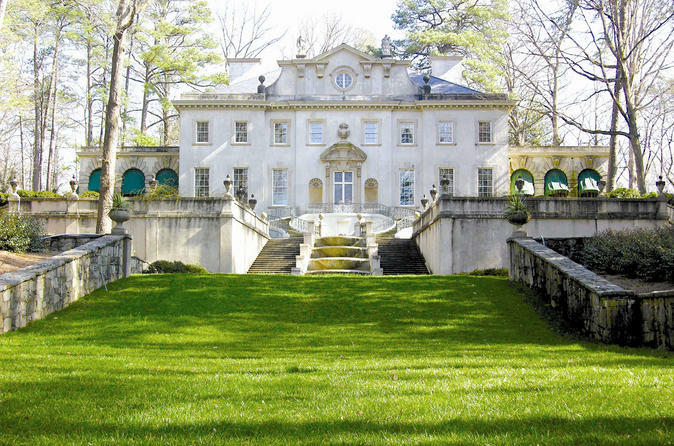 On this beautiful guided tour you will visit two of the cities most affluent neighborhoods, Ansley Park, Midtown and Buckhead districts in Atlanta. This tour allows guest the opportunity to tour three of Atlanta's most storied historical homes on this guided small group tour, lean about Atlanta's culture and history from your local tour guide. Explore inside of the main house and gardens of the beautiful, historical Homes. Learn about the history of each home as you step back in time. Take a glimpse into the beautiful homes that reside in these neighborhoods and step into the affluent world of those who reside here. The Lunch stop is at the beautiful Swan Coach House, not just restaurant, but a Buckhead tradition for the women who lunch. (price of lunch is not included in tour price). Tour includes visit two of the historical homes on our list. Swan House, Margret Mitchell "Gone with the Wind" House, Governor's Mansion or Rhodes Hall on this guided tour of two of Atlanta's famed historical neighborhoods, enjoying local pickup and round-trip transportation. Built in 1928 for the Harvard H. Inman family, the Swan House is one of the most recognizable and photographed landmarks of Atlanta. Noted architect Philip T. Shutze designed Swan House and its gardens, as well as many other distinct buildings in the city. We tour OUTSIDE of the home only. Lunch is at the Swan Coach house. Please note, doing private events being held at the restaurant, we may lunch at an alternate location. Tuesdays, Wednesdays, and Thursdays, we visit the Governor's Mansion, a Greek Revival style home built in 1967. The mansion stands on approximately 18 acres in northeast Atlanta. It was designed by Georgia architect A. Thomas Bradbury and officially opened on January 1, 1968. Completing the tour, you will head to The Margaret Mitchell House which was completed in 1899 by Cornelius J. Sheehan. In 1925, Margret Mitchell and her Husband John Marsh, moved into apartment No. 1 where Mitchell wrote the Pulitzer-Prize winning novel Gone With the Wind. Hear bout the life of Margret Mitchell. On Saturdays, the historical homes we visit varies. We may visit inside of two of the following houses: The Rhodes Hall, The Margaret Mitchell House, The Swan House or Smith Family Farm. Confirmation on homes visiting will be sent prior to tour day on. The Governor's Mansion is not available on Saturdays. The inside of the Rhodes Hall Built in 1904, prior to the development of Ansley Park, Rhodes Hall was designed by one of Atlanta’s most celebrated young architects for one of the city’s wealthiest men. Constructed of Stone Mountain granite in the Romanesque Revival style, it holds state-wide significance for both the quality and style of its architecture. © 2019 Hello Atlanta - All Rights Reserved.